Brush your teeth with coconut oil to prevent cavities, eliminate bad breath and reduce the risk of tooth decay and gum disease. Many people use coconut oil on the scalp to kill head lice bacteria and parasites, but coconut oil also works well at killing bad breath causing bacteria in the mouth. In fact, the glycerin in many commercial toothpastes derives from coconut oil. Read the label before you use a coconut oil product for your oral health to make sure it’s fit for consumption because some coconut oil products are designated for hair or skincare. 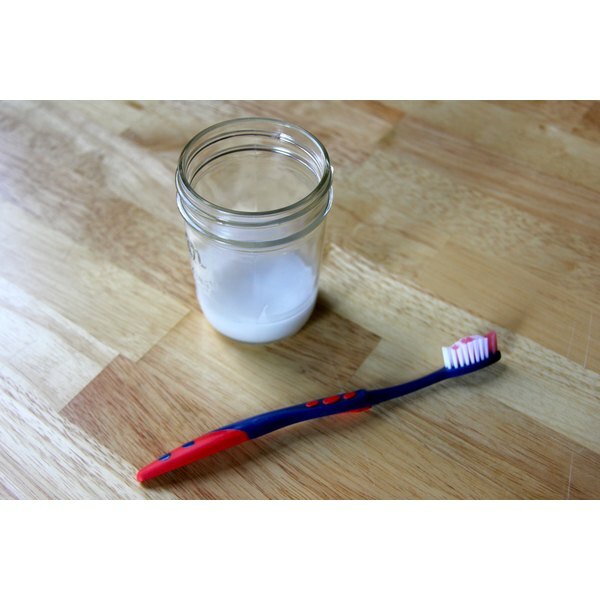 Learn how you can replace commercial toothpaste and use coconut oil for your dental health. Combine 2 tbsp. of melted coconut oil with 3 tbsp. of baking soda in a small bowl to make a paste. Blend the ingredients together with a fork until the paste resembles a regular toothpaste. In addition to turning the coconut oil into a paste, the baking soda contributes to the coconut oils effectiveness with its own teeth-whitening benefits. Wet your tooth brush with warm water and place enough of the paste on your tooth brush to cover the brushing surface. Brush your teeth in a circular motion with the coconut and baking soda paste focusing on a small group of teeth at one time. Brush your tongue to distribute the paste and remove bacteria to freshen your breath. Rinse your mouth with a cup of water and avoid spitting out the water in the sink. Spit out the rinse outdoors or in a trash bag and discard. Coconut oil hardens at cold temperatures, so traces of the oil poured down your drain could clog your sink if rinsed with cold water. Continue this process a few times a week to experience the benefits of brushing your teeth with coconut oil. Combine a packet of artificial sweetener and peppermint oil in your paste to add flavor. Store your paste in the bathroom, not the refrigerator, to prevent the coconut oil content from hardening the paste.